On April 27th 2012 the sun decided to shine after many days and weeks of rain. This was our wedding day and what a day it was! Putting these photos together has brought back so many wonderful memories. My two boys, 8 and 10, at the time, were so excited to be able to officially call my now hubby their ‘Step-Dad’. This made it an extra special occasion. Plus the fact that I was 8 weeks pregnant. There was a lot to celebrate. 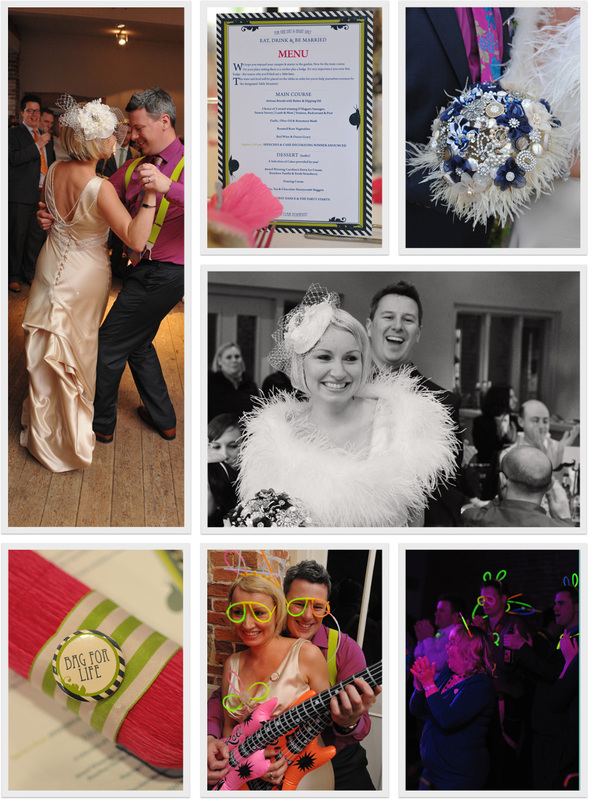 Our wedding was a vintage inspired wedding but the main theme was colour and fun for all. We invited our guest's children along too and provided an entertainer for them. This was really important to us because we are very much motivated by our wonderful families. It was what I call a ‘Pinterest Wedding’. I used the social network to get inspired and plan the big day. I’m a very crafty person, designed the event along with my graphic designer hubby and then had pre-wedding get togethers to make decorations for the venue. I even made the bridesmaid hair decorations and the fabric flowers for my beautiful bouquet. I had a 1920's Gatsby style silk dress designed by Leonie Claire in Brighton. l'd always dreamed of having one of those long floor length veils so had to stretch my budget so I could have one for the ceremony. It was after all my 'princess moment'. After the ceremony I adorned myself with an ostrich feather shrug and a vintage lace fascinator complete with birdcage veil. My shoes were midnight blue Comme il Faut tango shoes from Buenos Aires. Oh I was in glamour heaven! 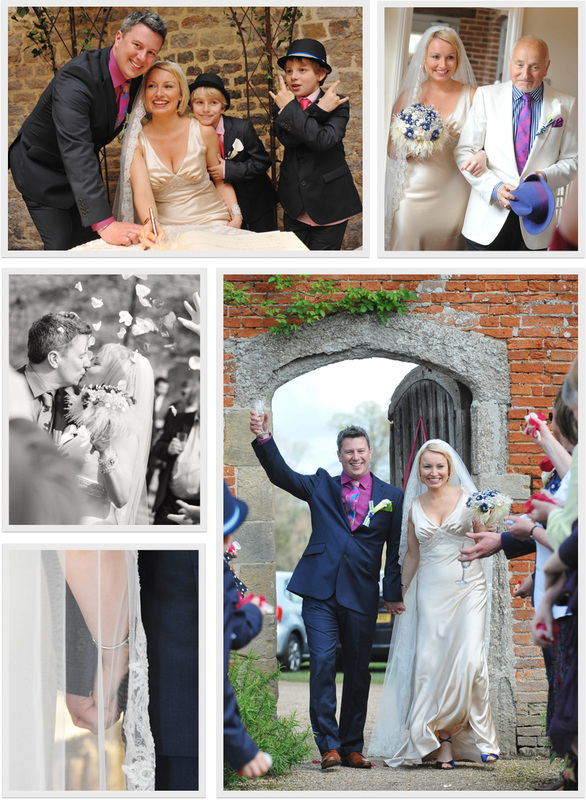 We held our big day at The Walled Garden, in Midhurst, East Sussex. It’s a delightful venue which enabled us to have over 100 guests, the ceremony and of course the all important party. The hubby and I wanted a GREAT party! After tears of joy at the ceremony, photos in the garden and a delicious meal, we set to the serious business of just having a fantastic evening of celebration. After we tangoed (yes really) our first dance, my fabulous Zumba teacher came and led a Zumba dance off. Afterwards, the band we hired, who provided us with music during the meal, played some funky tunes and then it was time for the ‘bandioke’. Oh my goodness, what a laugh that was. The hubby and his friends became Kings of Leon for the evening, air guitars a plenty. That night, neon bangles, necklaces and glasses adorned everybody, a fancy dress box provided additional party outfits and we sang and danced the night way. 18 months later we have Daisy, our beautiful baby girl whom the boys adore of course. Our wedding day truly marked a wonderful new chapter in our life as a family. You are not the average blog author, man. You definitely have something important to add to the net. 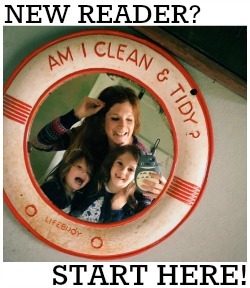 Such a special blog. I’ll be back for more.